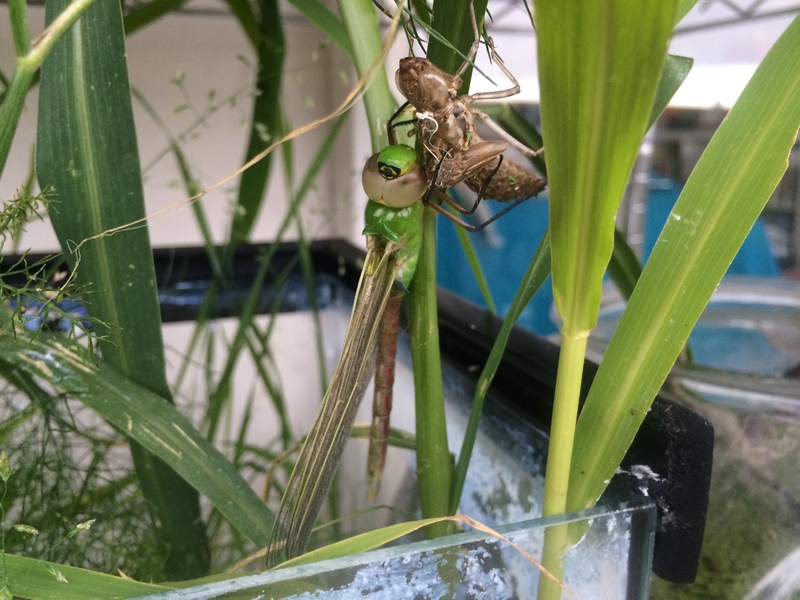 Many people don’t know that dragonflies, the Top Gun pilots of the insect world, spend the first year or more of their lives living underwater as wingless larvae. 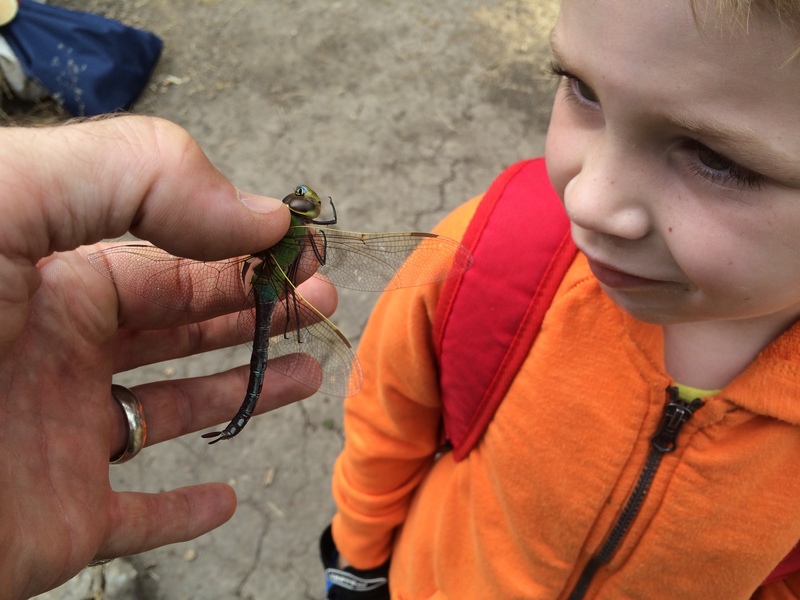 Some larvae — those of big, speedy darner-type dragonflies — tend to be long and streamlined. Others — those of skimmer-type dragonflies — are broad and squat and often hide in the muck and algae at the bottom of ponds. Whatever type they are, when they’re ready, they climb out of the pond on a stick or reed, or even onto a lily pad or raft of floating vegetation. The larva’s skin splits along the back and the adult or imago dragonfly carefully squeezes out. Its whole body is soft and vulnerable, and its wings are folded up tight. So it takes several hours to dry out and spread its wings to get ready for flight. Doing this at night is much safer, as there are usually plenty of predators like bullfrogs around. Kieran has several “ponds” full of greenish water and various aquatic creatures, including diving beetles, water boatmen, toe biters, scuds and snails, as well as larvae of both damselflies and dragonflies. He’s got larvae of both the skimmer and darner type dragonflies, but the biggest ones are of the most common and gorgeous Green Darner, Anax junius. Yesterday morning he woke me up early because there was some insect fluttering against his window — he thought it might be one of our big Hydrophilus triangularis beetles, which can fly and often are attracted to lights at night. 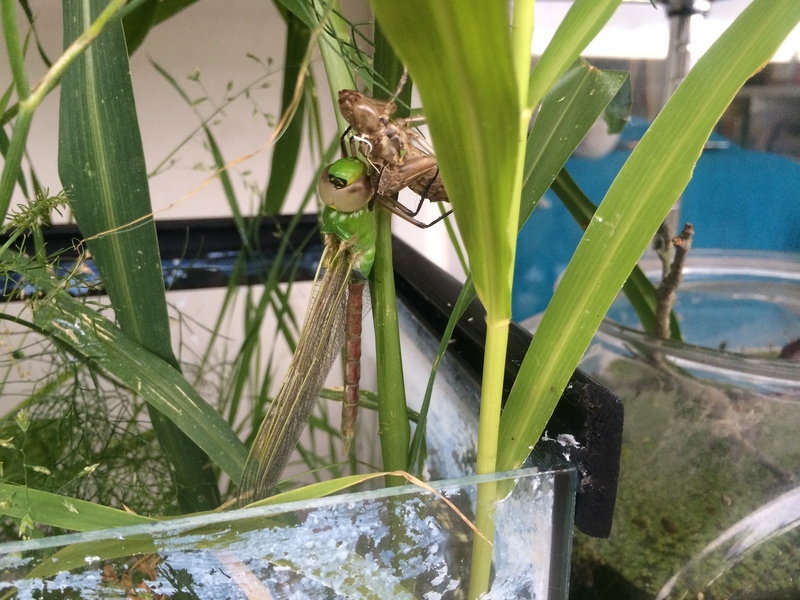 But it was a Green Darner, flapping its new wings against his window from the inside. During the night the larva had crawled out of the vase used as a pond for the beetles in his bedroom. It had scaled the antlers of a deer skull he found on Mt. Diablo, and the imago had emerged. We caught it carefully and Kieran held it in his hand, opened the window, and let it fly away across Lake Merritt. 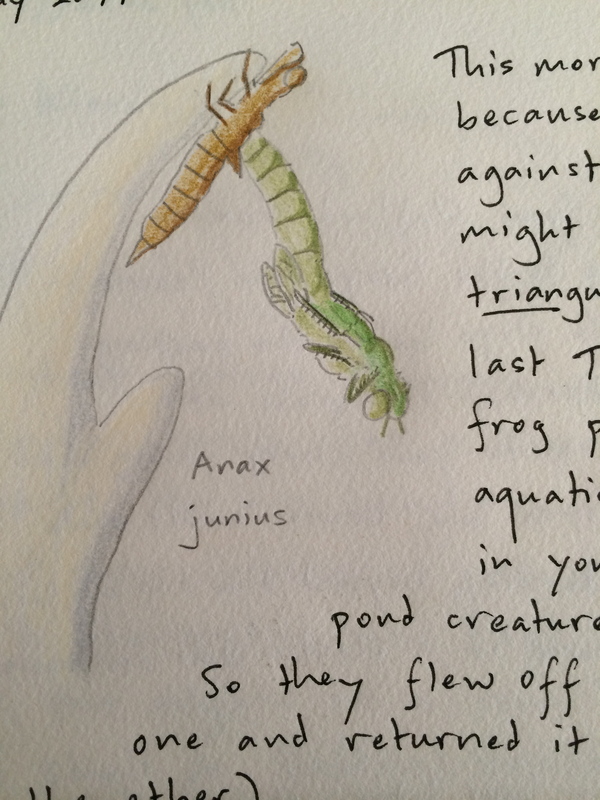 I wrote a brief entry about it in the diary I keep for my son, illustrating it with a drawing. This morning, we witnessed the miracle of metamorphosis directly. Besides his indoor pond, Kieran has a goldfish bowl outside on the balcony, adjacent to the terrariums where he keeps his praying mantises. 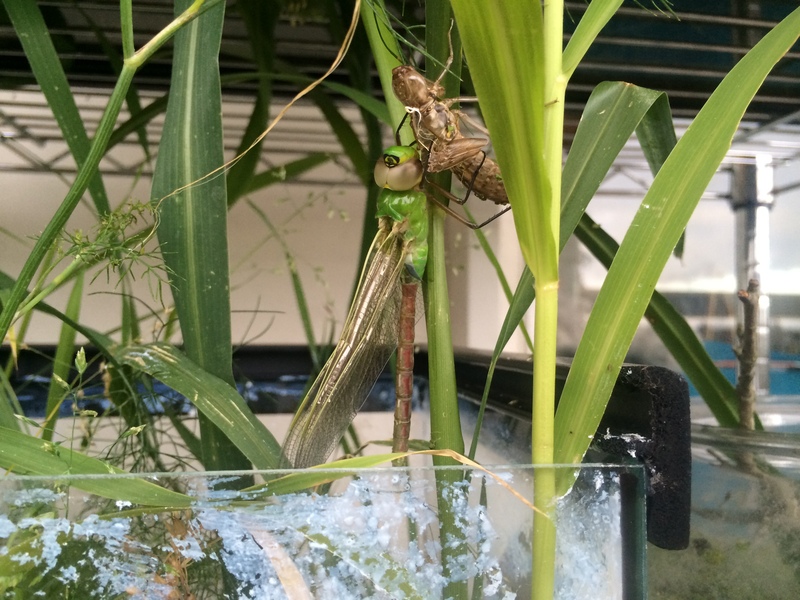 When we woke up today, we found another new Green Darner just emerged from the exuvia, or larval exoskeleton. The larva had climbed onto a tall stalk of grass in the next-door terrarium. The new imago’s colors were not yet set, though we could clearly see the “bullseye” mark on the top of its head developing. Once the colors are fixed, that bullseye is dramatic black, blue and yellow. The dragonfly’s body colors were still vague and pale, mostly green, but later the striking, vivid patterns would develop. About 10 minutes later, the new dragonfly fluttered its diaphanous wings and achieved an awkward liftoff, the first flight of its life. Bobbing and weaving, it flew off our balcony and away towards the lake. Within a few hours its flight will no longer be hesitant and awkward. Instead it will be a confident aerial master. Few people have witnessed this miracle of metamorphosis, and we felt incredibly lucky. The imago, or adult, had fully emerged from the nymphal shell, and was drying and extending its wings. The bullseye pattern on the dragonfly’s head, a characteristic of Anax junius, is visible. 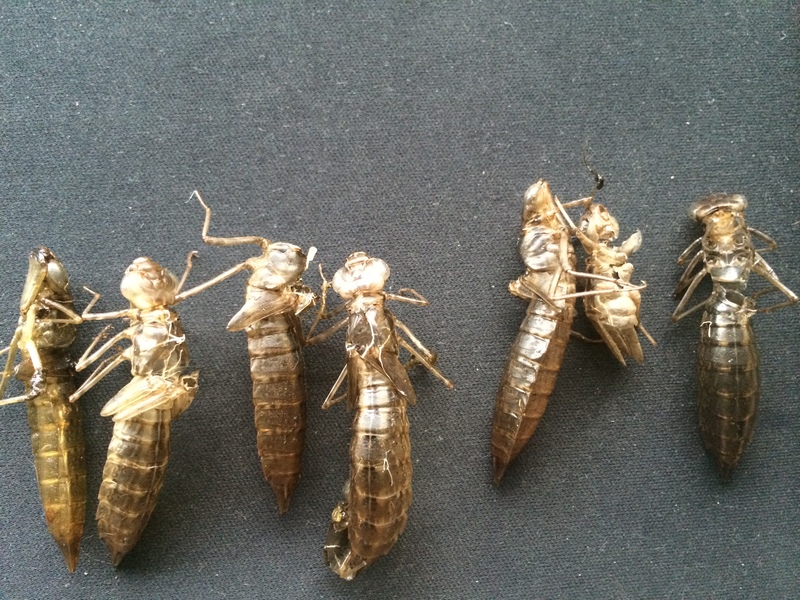 Because the delicate wings have been folded up, accordion style, inside the tight skin of the nymph, it is a long and risky process to unfold them and prepare for flight. The striking colors and the bullseye pattern of the adult are visible on this Anax junius we caught a week ago today in Briones. 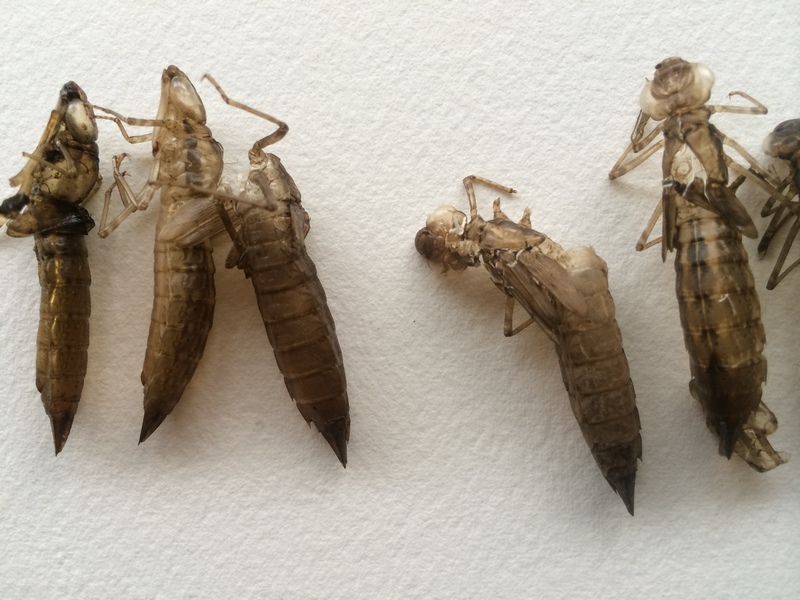 The cast off exuviae of darner dragonflies, collected near the Lake Merritt estuary. I had already written about the previous night’s emergence in the diary I keep for my son.